The company I’m working for, Die Mobiliar, started early with Windows 10, we rolled out in spring 2016 Windows 10 to all our physical devices and also to our virtual Desktops. We have two different kind of VDIs, pooled Win10 Desktops provided by Citrix PVS and also classical installed dedicated VDIs. Both with Citrix XenDesktop 7.x. To be in the role as early-adopter with such a new operating systems is interesting but also nerve-racking on some days… Especially when you add Citrix XenDesktop on top to Windows 10 and then also special requirements like physical and virtual Smart Cards. Now our story goes into the next round, we installed Windows 10 last year with the 1511 Release and we want to go now to the anniversary update (1607). For our pooled desktops it’s no question, fresh install on the new build. But an fresh install of the dedicated desktops where users have installed their own stuff will get me into big troubles … it’s really not an option! It’s not possible to update Windows 10 from one version to the other when a Citrix Virtual Desktop Agent (VDA) is installed! 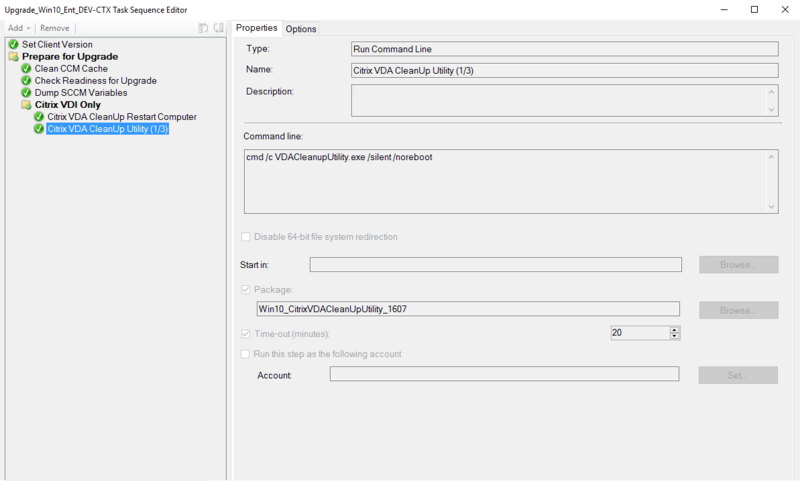 Uninstall of Citrix VDA fails most of the times! 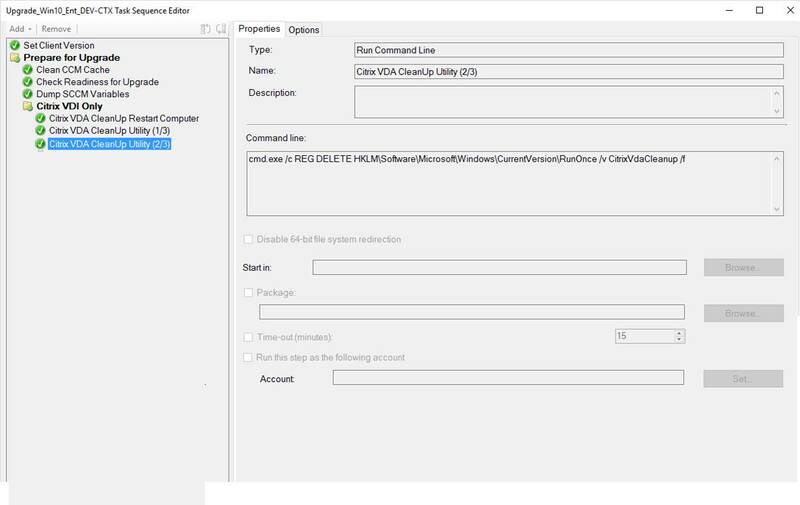 Bad News: VDACleanupUtility.exe (VCU) should run as a User, need a reboot and login with the same user, what means it’s not in a easy way to automate that. 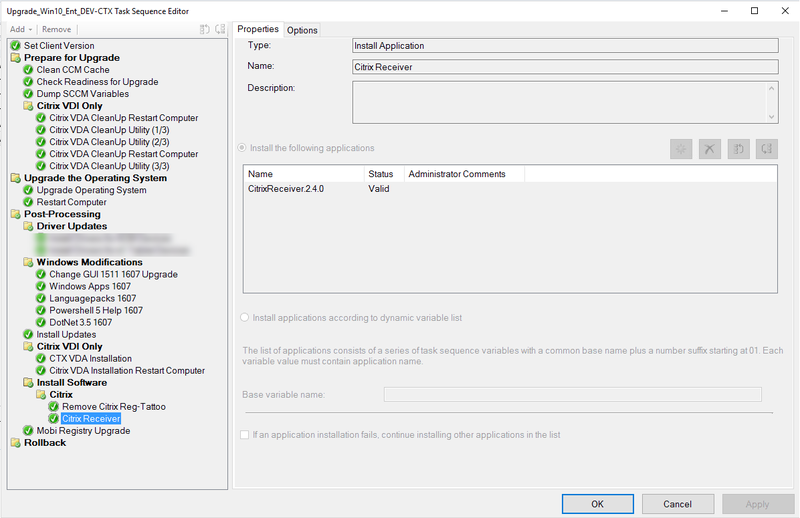 With some hints of the CTP colleague Stephane Thirion and my collegues at “Die Mobiliar” I was able to create this guide to automate the Windows 10 Update with an automated removal of the VDA. We are doing this with Microsoft System Center but with the following infos it’s also possible to fulfil this challenge with other ESDs. The Citrix VDI specific things highlighted in yellow, in this guide I’ll focus on that. We are using one task sequence to update all our Windows 10 installation, thats the reason we need to made a decision if the installation is a VDI or not. After the OS upgrade we just install the VDA again with our existing software package. Because the Windows upgrade kills the Citrix receiver we also re-install the receiver at the end. The really hard part is the proper automated removal from the VDA, and thats where I go a bit into the deep in this article. Sometimes the VDACleanupUtility ask for a reboot, it’s good to start with a reboot before any other steps are done. The VDACleanupUtility.exe is the only thing in the Package you see on the screenshot. here you also need to think about drivers or in virtualized environments XenTools, VMwareTools, etc. 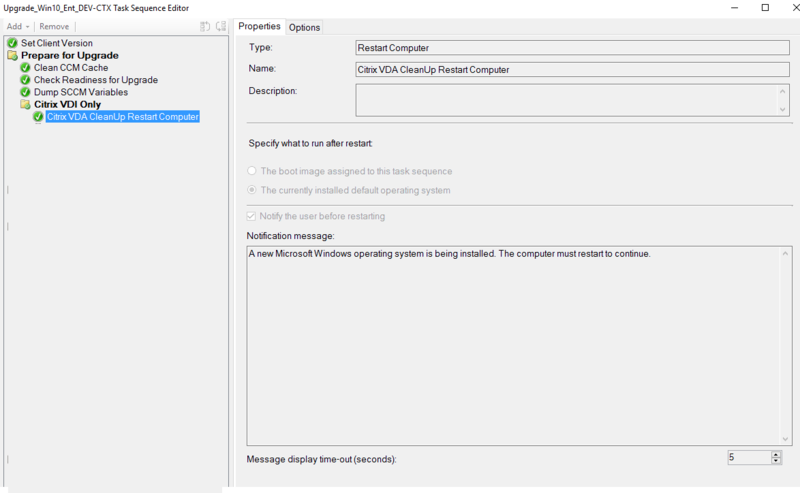 I want to thank here to Stephane Thirion (https://www.archy.net) for the hints about automate the uninstall of the VDA. Also thanks to my colleagues Stefan Moser and Thomas Hahnel at Die Mobiliar with more Knowhow about SCCM Task Sequences and patience on testing. The Version of the Cleanup tool in September 2017 is able to run in unattend mode, see https://support.citrix.com/article/CTX209255 . 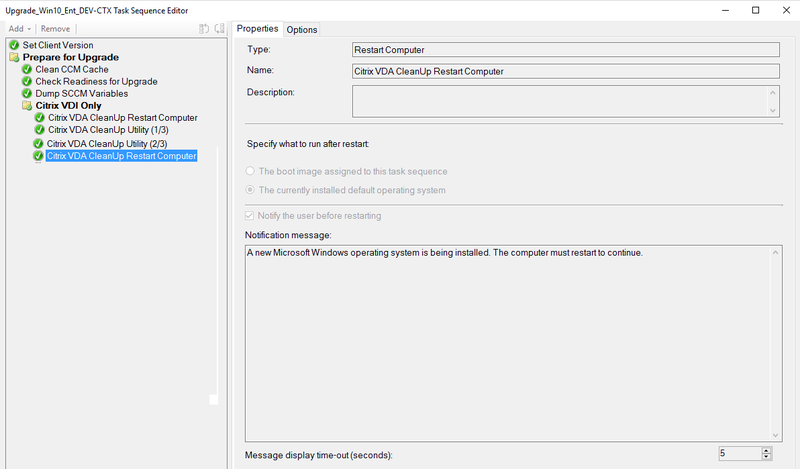 Also I’ve found out that the Update from 1607 to 1703 or 1709 works even when a VDA is installed.